Stainless Steel Self Drilling Tek Screws or stainless teks are self drilling stainless sheet metal screws with a drill point tip or self tapping tip. 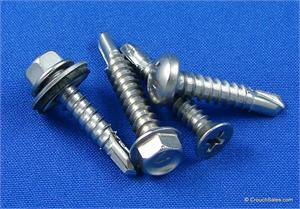 Stainless Teks are self drilling screws used in metal without the need of a pre-drilling hole. Stainless self drilling tek screws are available in several head styles and drives including stainless hex head teks, stainless hex teks bonded seal, stainless phillips flat head teks, and stainless phillips pan head teks.